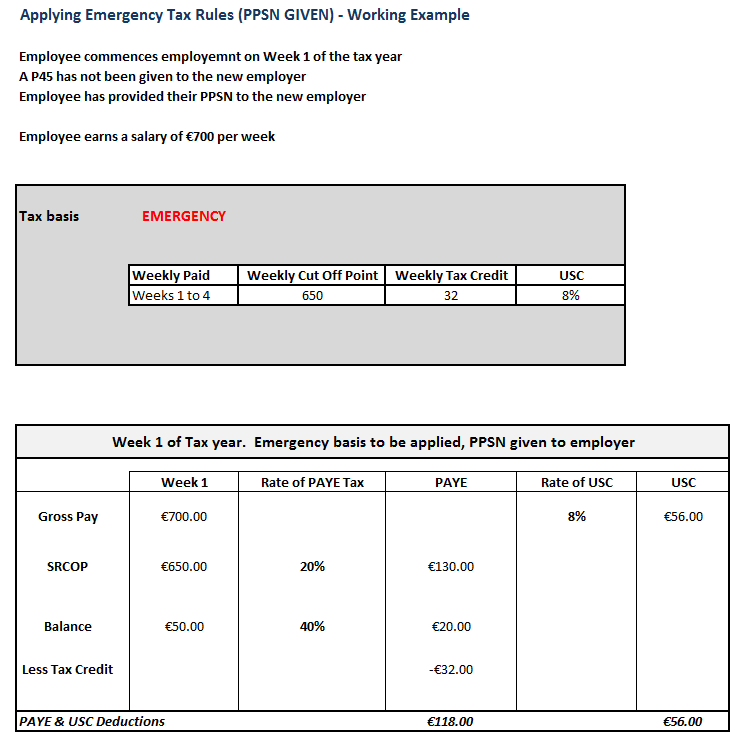 the employee has given the employer a completed P45 without a PPS number and not indicating that the emergency basis applies. A refund of tax or USC should not be made to the employee where the emergency basis is in use. Once Revenue issue a valid tax certificate for the employee to the current employer, the employer should cease operating the emergency basis and follow the instructions as per the new tax credit certificate for the operation of PAYE tax and USC. 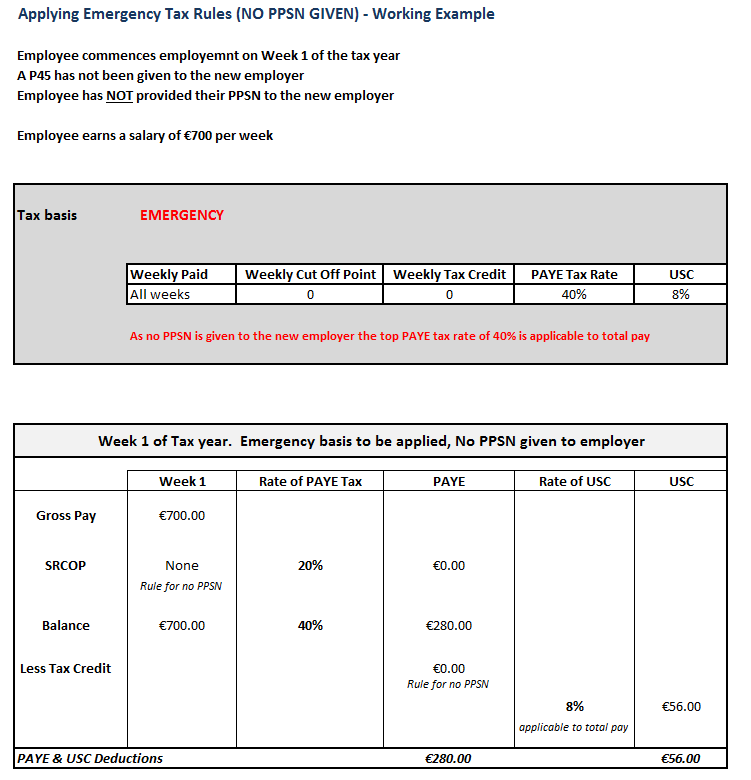 Different rules for emergency tax apply depending on whether or not the employee has provided the employer with their PPS number. Where the employee does not provide their PPS Number, the higher rate of tax applies to all earnings. 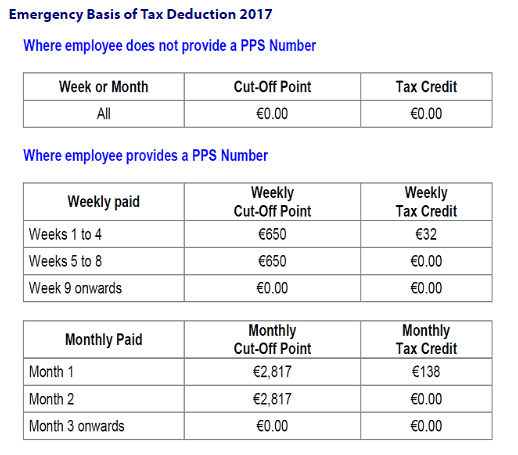 Where the employee provides their PPS number the provisional tax credits and standard rate cut-off point are to be granted. Separate periods of employment with one employer treated as one continuous period for emergency basis purposes. It is important to note that where an employee has separate periods of employment with one employer in one income tax year, to which the emergency basis applies, the employment is deemed to commence at the start of the first of these periods and continue to the end of the last period of employment or 31 December whichever is earlier. A weekly paid employee commences work in income tax week 10, leaves in week 14, resumes work with the same employer in week 28 and leaves finally in week 29. The emergency basis applies throughout. Weeks 10, 11, 12 and 13 are the first four weeks of employment for the purposes of the emergency procedure. Week 14 is the fifth week. Week 28 is the nineteenth week (i.e. fourteen weeks after week 14). Week 29 is the twentieth week for the purposes of the emergency procedure. When an employee recommences employment with you, within the same tax year, for which the previous period of employment the emergency tax basis applied, you must indicate the number of weeks in this previous period of employment in order to recommence the emergency rules at the correct week. 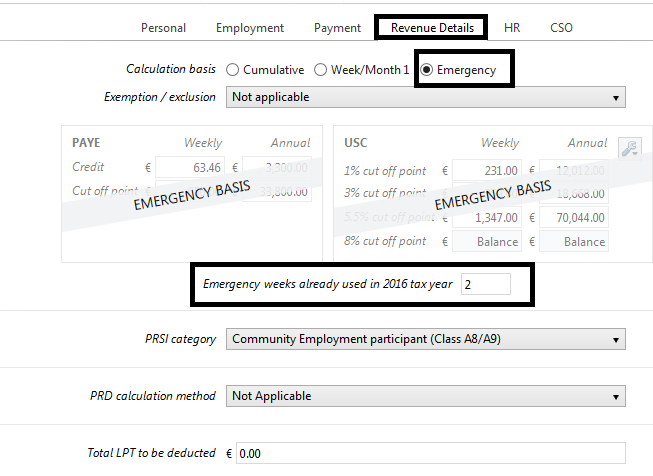 Once Emergency Basis is selected the option to enter the number of weeks previously taxed under the emergency basis, in the current tax year in previous employment with the same employer, an option to enter this number of weeks will appear on screen. The entry of the number of weeks has no effect on insurable weeks etc, it simply indicates where the employee is in terms of the previously used portion of emergency basis tax credit and SRCOP, remember these can only be allocated once within the tax year. If the emergency basis is still in operation on the following 1st January (new tax year), the employee is deemed to start a new period of employment on that date resetting the Emergency rules to restart the Emergency basis as if employment from 1st January is the commencement date of the emergency rules. Deeming an employment to commence and continue in this way is solely for the purpose of reckoning "weeks" or "months" so as to apply the correct emergency tax credits and standard rate cut-off points and tax rates. A weekly paid employee commences work in income tax week 46 and leaves in week 5 of the following tax year. The emergency basis applies throughout. Weeks 46, 47, 48 and 49 are the first four weeks of employment for the purposes of the emergency procedure. Weeks 50, 51 and 52 are weeks five, six and seven for the purposes of the emergency procedure. Weeks 1, 2, 3 and 4 in the new tax year are the first four weeks of employment for the purposes of the emergency procedure. (As stated above, the employee is 'deemed' to start a new period of employment on 1 January). Week 5 is the fifth week for the purposes of the emergency procedure. The basis to be applied to the calculation basis of PAYE and USC deductions applied to an employees salary are always tied. The only exception to this rule is Exempt cases. An employee can be hold PAYE exempt status but the standard USC rates and COP apply on either a Week 1 or Cumulative basis. Likewise an employee can be USC exempt but subject to PAYE on a Week 1 or Cumulative basis.